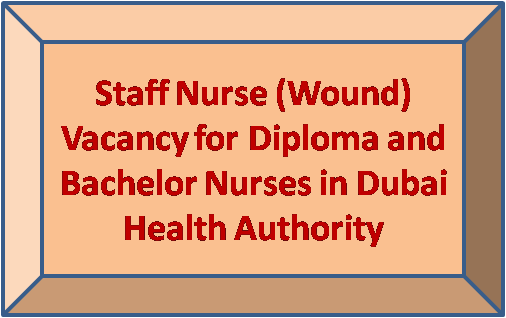 We have found an excellent opportunity for all Diploma and Bachelor Nurses with adequate experience to become Staff Nurse (Wound) in Dubai Health Authority Nursing Department. You may apply direct through the official website of Dubai Health Authority Nursing Department, vacancy announcement page. Please don't miss this wonderful opportunity to become a Staff Nurse (Wound) in Dubai Health Authority Nursing Department.